As the winter months go by, your vegetable garden designs and plans should be ready and the necessary seeds listed and ordered long before planting season. With vegetable gardening software and online garden planners, it easy to layout your vegetable beds, add new plants and move them around directly on your computer to get the perfect garden plan. As soon as the vegetable garden plans for the coming spring are complete, it will soon be time to begin starting seeds again. Markers for garden rows, stakes for supports, bean poles, all the little accessories needed for garden layout, should be purchased during the cold weather. When the garden rush is on, there is little time for making these supplies, and one is glad enough to have them ready. The year for garden work really has no beginning and no end, but by utilizing garden software and online planners you can easily grow fresh, homegrown, organic vegetables in your backyard garden. Need help deciding how to design your vegetable garden this season? Now you can drag and drop hundreds of plants to design the perfect vegetable garden on your computer screen with the help of the KGI Garden Planner. Whether you favor traditional row planting, raised beds or Square Foot Gardening the vegetable gardening software adapts to suit your gardening style. This online garden planner makes it simple to create plans, print customized planting calendars and rotate crops from year to year. The KGI Garden Planner works just like software you are familiar with, including features such as undo, copy and paste. The online vegetable garden software warns you where you should avoid placing each vegetable based on what was in your previous years' plans. Gardeners can opt to receive email reminders of when to sow and plant each of their vegetables. The KGI Garden Planner is completely free for 30 days - ample time to plan out your whole growing area. Plangarden vegetable garden software provides excellent help to design, layout and plan a vegetable garden. It is an easy, useful, powerful and fun garden design tool. This web-based software for vegetable gardeners manages garden plots up to 5 acres (2 hectares) and also accommodates square foot gardeners. This vegetable garden planning tool allows users to upload their own images and implement user-defined labels to mark plants, garden plots, beds, containers, and where they're located in their own yard. Social networking features enable vegetable garden enthusiasts from all over the world to interact over a "virtual backyard fence" where they can ask or swap advice. With the enhanced Shared Garden feature gardeners can leave comments, rate and watch other shared gardens, allotments and small farms. Plangarden offers users a 45-day free trial of their vegetable gardening software. The Vegetable Garden Planner provided by Mother Earth News lets users create customized vegetable garden plans based on their local climate, desired crops and rotations within the garden. The vegetable gardening software provides details for more than 80 fruits and vegetables, 29 herbs and 13 cover crops. The crops all are coded with space requirements, so once a crop is placed into a plan, the vegetable garden software will indicate how many will fit into the selected space –all this is beautifully organized right on the computer screen. To make crop rotations easy, plants are color-coded by their botanical family, and the software keeps track of the plants’ location in the garden. When the user works on the next year’s garden layout, the software will automatically look at the previous year’s plan and warn if the gardener deviates from standard rotation practices. A 30-day free trial of the Vegetable Garden Planner is offered and gift cards to give your favorite backyard gardener are available. 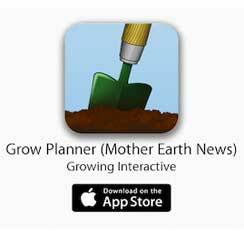 For those who plan on the go, the Grow Planner for iPad from Mother Earth News is a revolutionary, multi-functional garden planning tool for vegetables, fruits and herbs. It makes gardening easier by turning your iPad into digital graph paper on which you can sketch out your garden plans—plans you can take right out in the garden with you. With the Grow Planner app, you can browse catalogs from several major seed suppliers, add your own varieties, and even customize the spacing and planting dates for each crop. The app also provides bonus gardening content from Mother Earth News magazine, including information on garden pest control, maximizing your harvest, designing your garden with permanent beds and paths, controlling weeds, and more.